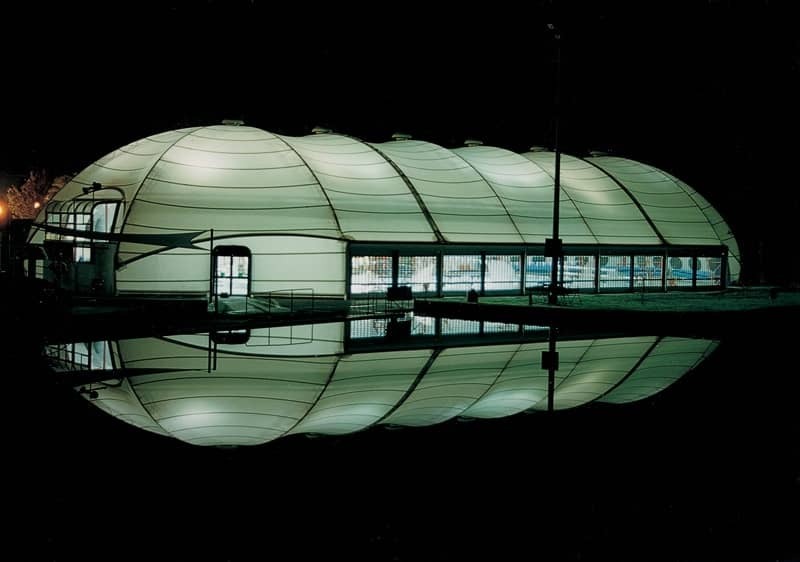 At night, Shelter-Rite's dual membranes' translucency adds impact to the structure, which actually glows attractively like a lampshade. By modifying a Portomod tension structure with a new outer membrane and liner of Shelter-Rite® PVC polyester fabrics by Seaman Corporation, the Singleton Aquatic Centre now has superior protection from wintry weather, contributing to efforts to make the swimming facility suitable for all seasons. The center, located in Singleton NSW, Australia, houses a heated 25-meter indoor pool, toddler pool and associated facilities. A 30-meter wall made of 10 roll-up modules can be easily opened to invite the natural summer warmth, or closed to withstand wintry cold. VESL Tension Span created an outer membrane of Seaman's Shelter-Rite fluoropolymer coated PVC polyester fabric and an inner liner of Shelter-Rite acrylic PVC polyester fabric, effectively doubling the insulation factor. There are also aesthetic and functional advantages. At night, the dual membranes' translucency adds impact to the structure, which actually glows attractively like a lampshade. In the daytime, either sunny or cloudy conditions create a soft, shadow-free interior lighting that is sufficient to eliminate the need for artificial lighting. VESL said Seaman's fluoropolymer coated fabric also was ideal because of its long-term self-cleaning membrane surfaces. To further minimize maintenance and extend the life of the structure, all extra steelwork was hot dip galvanized and finished with quality polyurethane.